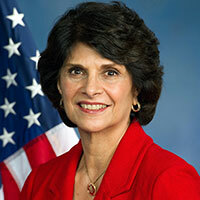 In 1992, Congresswoman Lucille Roybal-Allard became the first Mexican-American woman elected to Congress. As a member of the U.S. House of Representatives, the Congresswoman has worked tirelessly to create jobs, improve health services, and create stronger, better educational opportunities for her constituents. She has been a leading congressional force for comprehensive immigration reform, and is an original co-author of the Dream Act, which would give undocumented students a path to citizenship. She also ranks as one of the House’s foremost supporters of a strong homeland security system, labor unions, veterans, and the rights of women and children. The congresswoman serves on the House Appropriations Committee, and on two of its important subcommittees: Homeland Security, on which she is the ranking member; and Labor, Health and Human Services, and Education. She is the first Latina to serve on the House Appropriations Committee, and as a chair or ranking member on a House Appropriations Subcommittee. The congresswoman proudly represents California’s 40th Congressional District, whose population includes the highest percentage of Latinos of any district in the country, and the largest number of DACA-eligible individuals. She is a member and former chair of the Congressional Hispanic Caucus (CHC). Her father, the late Congressman Edward R. Roybal, co-founded both the CHC and CHCI. She is also a House Democratic Senior Whip, the founder and co-chair of the Women’s Working Group on Immigration Reform, a founding co-chair of the Congressional Caucus on Maternity Care, and a vice chair of the Congressional Task Force on Seniors.